Sometimes a bit neglected in the world of Astrology, or simply too fresh to notice clearly for many of us, is the topic of out of bound planets. When we consider their impact on the world and their extreme nature that provides us with insights that we often seek in Astrology itself, it might be wise to consider examining it a bit more, as a source of knowledge and the touch of the Universe in our Earthly manifestation. What is an “Out of Bounds” Planet? We say that a planet is out of bounds when it leaves the declination defined by the maximal angle that the Earth forms with the Sun, or to be exact, when it is located more than 23⁰26'22" either north or south from the equator. This data is easily reachable in most astrology software or in ephemeris that provide information on latitude and declination of the planets. Since the Sun defines this boundary, it can never be out of bounds and we will see that Saturn and Neptune never leave it either, which makes an interesting topic on its own. Examine your horoscope by searching for planets that have a higher or lower declination than defined by this angle. It is clear that something must be unsystematic and different in lives of individuals with one, or more out of bounds planets. Not only will such a planet speak of extremes that the area of life which it represents will go through, but also it speaks of an inner state of imbalance that is hardly ever recognized by the environment. When an out of bounds entity rules one’s ascendant, its impact is of immense intensity, challenge and value, and speaks of a person’s need to see the entire system that surrounds them from a different perspective and bring change to it. These individuals are often seen as rebellious, different, eccentric, or simply “not normal” from other people’s point of view, and their role in the world rarely steers away from a deep sense of shame that they need to overcome in order to shine in all their authenticity. No matter the house it rules, an out of bounds planet will always speak of a different nature that one feels the need to hide from the outer world. Mars and Venus will speak of two sides to sexuality (masculine and feminine) that bring a sense of shame in their purest form, and typically lead one to relationships that are out of the ordinary in many ways. While they can be healers for others and break taboos that keep our world stuck, these individuals will often be too ashamed to step up and show their true colors, guided by moral values and rules imposed on them by the environment. The out of bounds Moon will have another story to tell, with its deepest emotional quality and the sense of home that one can find in any surroundings if they look hard enough. In its negative and conflicted role, it will be hard for a person with an out of bounds Moon to connect, feeling as if they never belonged anywhere in the first place. Mercury and Jupiter will show incredible mental abilities and ways with words and philosophies that are extraordinary and guided by the Higher Truth, commonly questioned way too much for their truthfulness. Keeping in mind that the relationship of the Sun with us Earthlings defines the exact angle that is still considered “normal” for a planet to be found in, we can anticipate problems with authority figures and ego in general, as well as a point of view that is rarely shown clearly enough to be well accepted by the rest of the human kind. "Inadequate" and strange emotional and verbal outbursts will come as a typical signal of the inner battle for acknowledgment. While those whose planets fall in the realm of our relation to the Sun understand rules guided by life itself and our position here, on Earth, those of you who jump out of regular patterns connect to higher realms, the center of our galaxy and the Universe itself, and it is never easy to carry this role on your own. The most important thing any person with an out of bounds planet should nurture and cherish in their life is their relationship with other people with the same “disorder”. We will see that it doesn’t really matter which planet is found out of Sun’s realm of guidance, but those who have at least one of them in their chart will sense, smell, and in strange ways recognize those with a similar energy. True healing comes through such bonds filled with feelings of acceptance and adequacy, giving both out of bounds qualities the opportunity to be recognized as “normal”. Perceived through a relationship as natural and even common, such an extreme entity has a chance to become the truth one relies on, and this support gives freedom to step out and change your ways and circumstances in the outer world. While this may alienate you from other people at first, it is always good to accept the flow which allows one to grow and expand their consciousness, instead of constantly shoving it aside. By allowing regeneration and healthy boundaries to be respected, you will get connected in a healthier way to all those “normal” souls in the long run and get stronger in anticipation of sensations and feelings that lead you towards the rightful place you were meant to take in this world. If you have an out of bounds planet in your natal chart, try to think of yourself as lucky. Instead of giving in to constantly “feeling crazy” and inadequate. Stand firm on your own two feet and surround yourself with other people that share your position through any celestial entity. The love that two out of bounds souls recognize with one another shouldn’t be taken for granted, and it will inspire and guide you into new challenges and personal battles, surely to show you the right path to follow as your true self. It is impossible to outrun your out of bounds nature, but it is necessary to embrace it and become aware of its incredible rewards. The freedom it may provide sets one free from limitations of Saturn and brings you closer to your enlightened selves, if you take reality for what it is and reshape it to fit your inner truths. 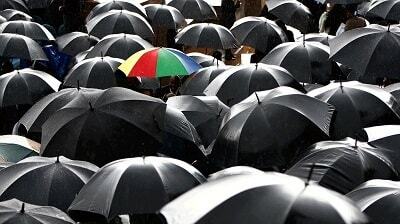 Happy to be different and stand out from the crowd, who knows what you might achieve?